With the first day of Fall nearly upon us (yes, already), the hot and boozy days of peak rosé season are sadly numbered. But it looks like you're about to get another good reason to keep hitting the pink stuff before switching to red wine and pumpkin beers this month, now that Aldi -- yes, Aldi -- is releasing its award-winning $8 rosé in the United States. Get your damn stemless glasses ready. 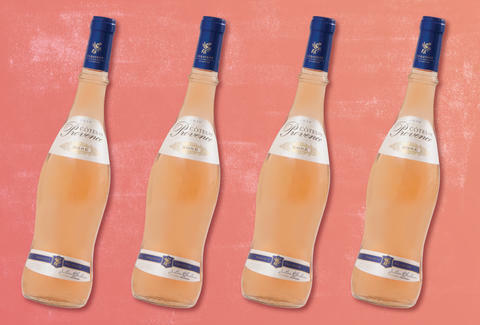 The discount supermarket chain announced that you can finally get your hands on bottles of the low-cost wine -- the Exquisite Collection Cotes de Provence Rosé 2016 -- at its stores across the US, starting on Wednesday, September 20. The wine's long-awaited American debut follows the explosion of international attention it received earlier this year, when word got out that it had been named the best value rosé at the prestigious International Wine Challenge for a second year in a row and was on sale at Aldi stores in the United Kingdom. This will be the first time you can buy it in the 'States, but only while supplies last, according to the company. Get ready to fall for our internationally acclaimed rosé, in stores 9/20! But hurry, a rosé this famous won't last long. Aldi said the rosé features "delicate yet intense" strawberry and white fruit flavors along with a subtle touch of spice, which may actually make it slightly more palatable on early Fall days. The wine was originally made by renowned winemaker Julian Faulkner as an exclusive offering at Aldi's UK stores, but that all changes now with the new, limited-edition batch in the US. With an official price tag of $7.99 per bottle, the wine comes in way below what you'd pay for many other wallet-friendly rosés on the market. So, really, the biggest obstacle to drinking the stuff will be getting a bottle before they're all gone. Best case scenario: you get some and rosé season is extended by a couple of weeks. Worst case scenario: they're sold out and it's time to switch back to your usual reds and harvest ales. Cheers either way. Tony Merevick is Senior News Editor at Thrillist and is sad that rose season is almost over, though. Send news tips to news@thrillist.com and follow him on Twitter @tonymerevick.